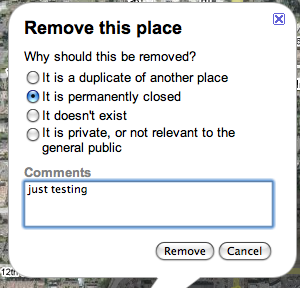 A few weeks ago, I wrote a story named Google Maps Closes Down Business When it is Still in Operation. In short, Google labelled a business in Google Maps as being closed, when it was actually in business and servicing companies. Back then, I thought it was an issue with a user not correctly setting his or her Google Local Business Center information. But I was wrong. 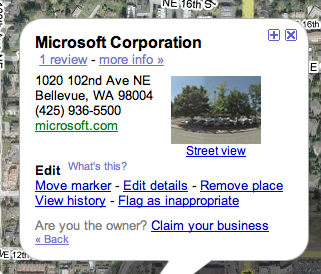 It seems to be a bug with Google's Local Business Center. We have several threads in the Google Maps forum and one longer one in the Google Maps Help discussion area. Googler, Joel H described how this can work. But let me show you how you can do the reverse, i.e. 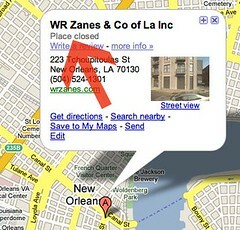 close down a business on Google Maps without having access to that business. 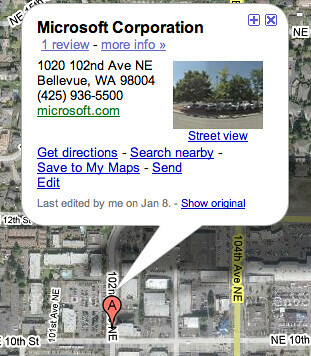 Let's go to Microsoft's listing in Google Maps. 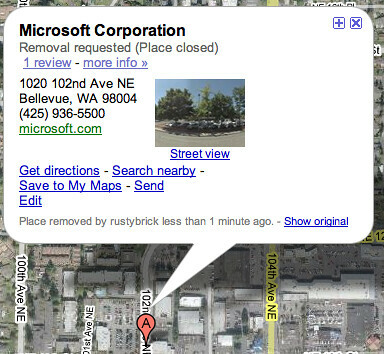 Then click on "Remove Place:"
Like I said, it will likely be rejected, because it is Microsoft. That is why I picked Microsoft. But for some smaller businesses, removing them, might slip through the cracks, like they did for these businesses. If your business is verified with Google's Local Business Center, I don't think there is a way for anyone to make this request. But for the majority of business in Google Maps that are not "verified," this can easily be done and potentially hurt sales for those businesses. "Community Edits," aren't they great? FYI, this is nothing that new. I am illustrating this not to have a bunch of people start removing businesses, but rather to make it harder for these things to happen. Clearly, this has turned into a bigger mess then one expected. Update: If you have this problem, you can learn how to fix it here.